A neutral statement of reality: none of the three keyboard cases tested here are particularly amazing to look at. They're just tablet cases, after all, so it's probably best if they retreat into the background as much as possible when they're not in use. By this criterion, the Belkin Ultimate comes out on top, due to its understated combination of a rigid, matte metallic plate on the outer keyboard side and a soft, black faux-leather feel to the material that covers the iPad itself. There's nothing overwhelmingly premium about it, but the materials come together well and also have the advantage of being significantly lighter than the other two keyboards -- just 421 grams (0.93 pound), compared with the next lightest alternative, Logitech's 630-gram Folio. Then again, if you compare at the galleries above, you might think it's insane to rank the Belkin above the ClamCase Pro for design. After all, the latter product consists of genuine aluminum, making the keyboard section totally inflexible, and the keys, hinge and rear cover all have a clean, Apple-esque simplicity to them. So why doesn't it rate first? 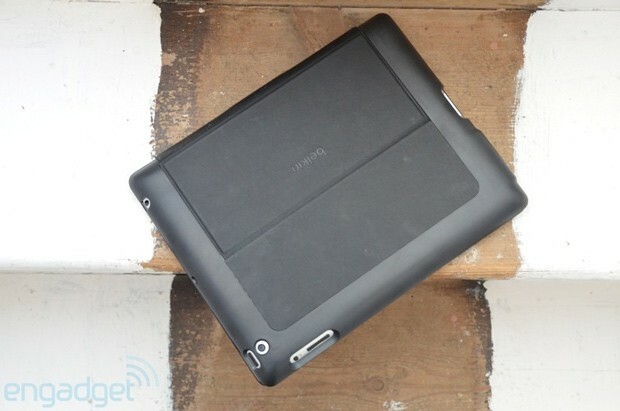 Because it's so darned big and bulky, that's why: the case weighs 717g (1.6 pounds) on its own, on top of 662g (1.46 pounds) for a 3G iPad 3, resulting in a total of 1.4kg (just over three pounds). 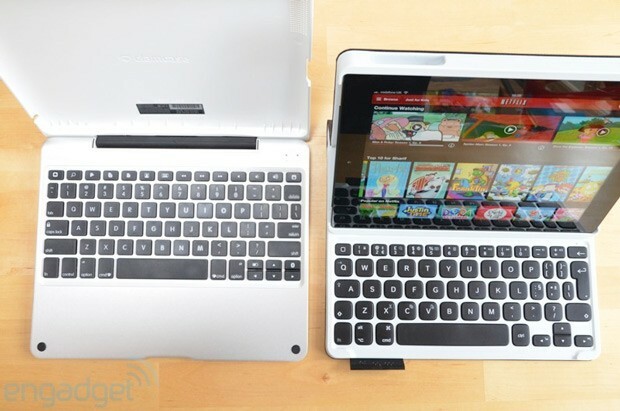 A Chromebook would be lighter and wouldn't cost much more, so the ClamCase Pro is only relevant to those who are insistent on turning their iPad into their primary computing device. "A Chromebook would be lighter and wouldn't cost much more." Bringing up the rear in this first section, we have Logitech's Folio, which somehow contrives to be almost as heavy as the ClamCase Pro while offering even less rigidity than the Belkin. When closed, the Folio looks like a school textbook wrapped up in a black cover of synthetic fabric, and with a thick layer of white rubber in between. The materials are more honest than Belkin's, since nothing is pretending to be something else, but that only disproves the old adage about best policies, because the end result doesn't look like a $100 purchase. As for the battery life of the cases themselves, that was never an issue either. In fact, they're all still working fine after around four weeks of use (or around one week of heavy use per keyboard) without having been charged since they were taken out of their boxes. The ClamCase Pro has a nice battery life indicator, accessed by pressing a dedicated function key, which reveals that it still has 50 percent of its juice after all this time. However, this is where the commonalities come to an end. Each keyboard case has serious strengths and weaknesses, which could make it either a good buy or a terrible one depending on how you plan to use it. 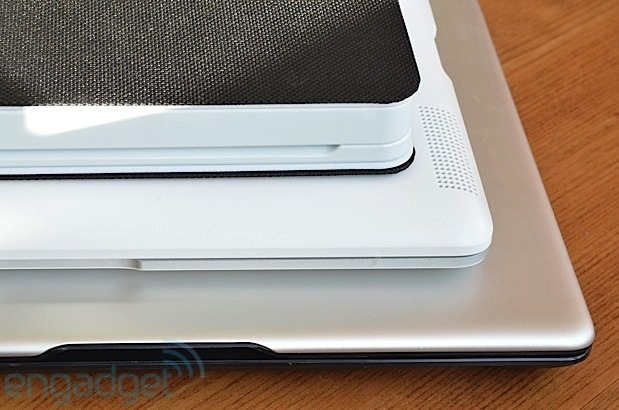 As mentioned, the Belkin wins on weight and is our favorite for general portability. However, it's not our favorite for working on uneven surfaces, like a lap or bed cover, because the magnetic latch that props the iPad up at an angle will fail at the slightest provocation. The Logitech works in exactly the same way, but it has a slightly stronger magnetic clasp, which we found came undone less frequently. It also offers better protection courtesy of its thick rubber edging, and this soft feel also made it the easiest for inserting / removing the iPad. Logitech offers thinner and lighter cases, if you can do without such a thick protective buffer, but we found this model to be easily the best for rugged use and for children. Lastly, we come to our overall winner for this section: the ClamCase Pro. It has its flaws -- namely, its obscene weight and rigid plastic on the top half that makes it a chore to take the iPad in or out -- but it's simply more usable in more scenarios. Wherever you can use a laptop, you can use a ClamCase Pro. We found ourselves using the Yoga-style mode too, which makes it possible to eat in front of an iTunes movie without worrying about getting lobster shell on the keyboard. There's a minor design flaw in this area, which means that if you try to deploy a Yoga pose at the wrong angle, you'll end up muting the iPad because its volume rocker presses against the surface of your table. You have to make sure the angle is steep enough to avoid this, but overall it wasn't a big hold-up. We've saved this bit for last, because for us it seals the deal. The Logitech rules itself out in terms of pure typing comfort because it has the most awkward keyboard by far, with an "A" button that feels like it should be the Caps Lock button. The whole layout seems to have been shunted to the left somehow. You can see this from the photo above, compared to the more normal layout of the ClamCase Pro. This awkwardness makes the Logitech hard to get used to, and it resulted in way too many mis-hits even after a week of use. The Belkin was a lot easier to type on, allowing us to get up to 52 words per minute (wpm) while hunched over the iPad on our lap -- although, as pointed out earlier, the case always feels like it's about to collapse in this scenario. Still, it's comfortable enough to use on a flat-ish surface, and 50 wpm isn't bad at all. If 50 wpm isn't bad, then what's good? Obviously, the figures above have no meaning in absolute terms, since they reflect this author's typing speed as much as anything else, but in relative terms they reveal a lot. They tally closely with perceived levels of typing comfort while also proving that all these keyboards deliver on the central promise of beating touchscreen typing. In a broader context, typing on a big MacBook Pro is about as smooth as it gets on any sort of mobile device, and the fact that the ClamCase Pro was able to match that speed -- 58 wpm on a wobbly, bony human surface -- marks out that case as the winner of this section. We may as well just come out with it: the ClamCase Pro was our all-round pick of the bunch. 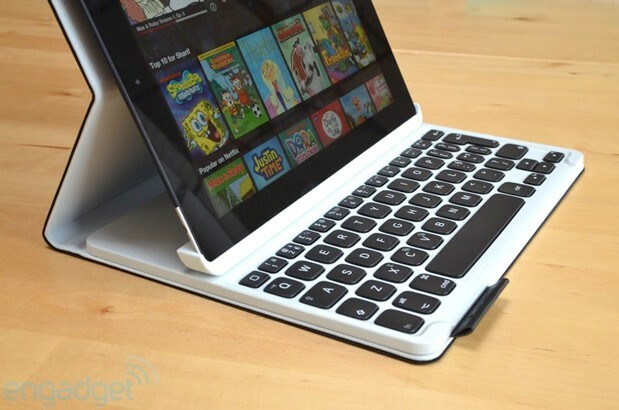 It wins mainly because it excels at allowing fast touch-typing regardless of whether there's a flat surface to rest it on, but also because it looks good and the invertible hinge allows it to work well as a stand. These advantages make it just about worth the $170 price tag for someone who already owns an iPad and who's starting out with the premise that it must be their default device for productivity. 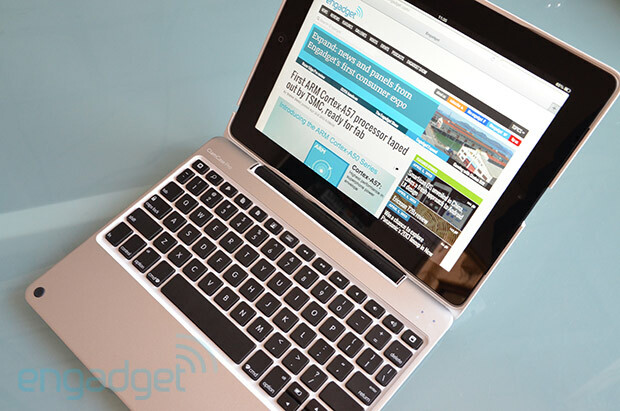 However, anyone who prioritizes portability over fast typing may find that the Belkin is their best bet. The Logitech can't be dismissed either: it offers superior protection and is excellent if your iPad will ever be handled by a kid. In any case, they all deliver vast improvements over the stock touchscreen keyboard, and the success of these products strengthens the whole notion of the hybrid or detachable device -- something Apple has so far ruled out, but which it probably ought to reconsider.